Designed for street 318-340-360ci Chrysler V8s. This intake manifold is for 318-360ci V8s with OEM 4-bbl. carb. ; 1966-72 (1973 non-CA); except stock equipped EGR. (Intake manifold p/n 350-3776 is for same V8's with OEM 4-bbl carb; 1972-87.) This manifold is not for use on marine engines used in salt water. Port exit dimensions: .97" x 1.95"
Manifold height: (A) 4.13" , (B) 5.13"
Will not fit 1992 and later Magnum engines. Performer manifolds are dual-plane, low-rise intake manifolds with a 180° firing order and a patented runner design that delivers outstanding performance. This patented design greatly improves torque over a wide rpm range, especially off-idle through 5500 rpm. Provides crisp throttle response. 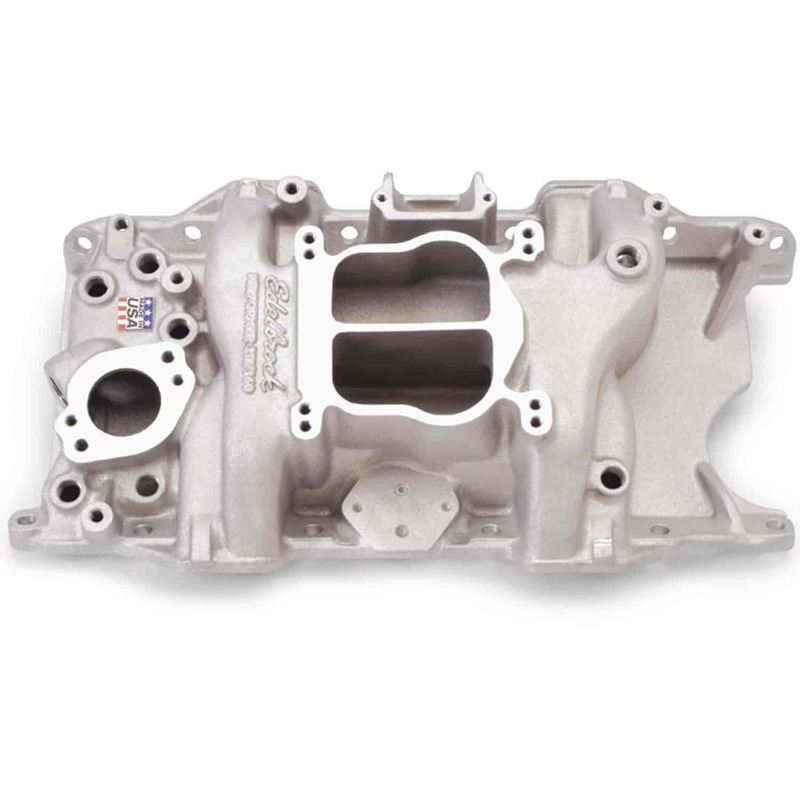 Does Edelbrock 2176 fit your vehicle? 2176 is rated 5.0 out of 5 by 1. Rated 5 out of 5 by kerjm from shipping was quick, great product as always with Edelbrock. Love Jegs. I have a 1958 Plymouth Savoy with a V-800, Poly 318A Wide Block engine, which is different from the later 318s. Does this fit the Poly 318? If not, is there an Edelbrock 4bbl intake you carry for the poly? No, they 318a wide block does not share any components with the more modern 318 LA engine. We do not have any intakes for that engine. Will this work on a 78 Ramcharger with air condition? Also will this work with 650 CFM Classic Holley Part # 0-80783C or can you recommand a Holley carb? Yes, this will work in that application. That carb is a good choice but it has the Ford kickdown lever on it, which you may interfere with setting up your linkage. We would recommend p/n 510-0-80457s for your 318. Yes this will work in your 70 Coronet and will work with that Holley Carburetor. Yes, this will fit your application and will not affect your A/C operation. Note:To insure proper manifold to cylinder head sealing, Edelbrock recommends using an embossed intake gasket like Fel-Pro's Printoseal or Mr.Gasket's Ultra Seal. Fel-Pro's Perma Torque Blue and other similar gaskets do not compress well when used with an aluminum intake manifold and may cause vacuum leaks.